Consequently, so much attention was given to the importance of muscle function that the idea of treating the muscles in order to activate the body’s own healing process came about. Using an elastic tape, it was discovered that muscles and other tissues could be helped by outside assistance. Employment of Kinesio Taping creates a totally new approach to treating nerves, muscles, and organs. The first application of Kinesio Taping was for a patient with articular disorders. For the first 10 years, orthopedists, chiropractors, acupuncturists and other medical practitioners were the main users of Kinesio Taping. Soon thereafter, Kinesio Taping was used by the Japanese Olympic volleyball players and word quickly spread to other athletes. 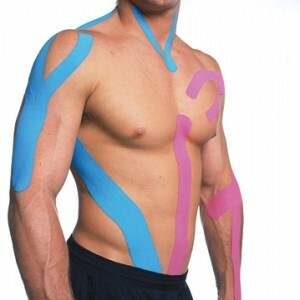 Today, Kinesio Taping is used by medical practitioners and athletes around the world. Kinesio Tape is used for anything from headaches to foot problems and everything in between. Examples include: muscular facilitation or inhibition in pediatric patients, carpal tunnel syndrome, lower back strain/pain (subluxations, herniated disc), knee conditions, shoulder conditions, hamstring, groin injury, rotator cuff injury, whiplash, tennis elbow, plantar fasciitis, patella tracking, pre and post surgical edema, ankle sprains, athletic preventative injury method, and as a support method.